Until relatively recently, atheism just seemed to me like a phase for confused college students—usually nothing to be taken seriously, only something to be outgrown. However, atheism has become more pernicious in recent years. Aside from those who are going through a phase of “amateur atheism” occasioned by trendiness, myopic biology professors, or tough situations in life, there are others in what can be called “professional atheism”. This is not the atheism of those who work, but of those whose work is atheism—at least in part. These atheists go about attempting to convince anyone who will listen that God doesn’t exist. Regardless of which camp they come from, atheist arguments can initially seem impressive. There’s no need to fear, however, because these arguments do not survive close examination. Take, for example, a question asked by countless souls through the centuries: “How can a good God allow so much evil and suffering to exist?” Atheists don’t ask the question in the hope of getting an answer, but instead, they use it as ammunition against God. What Patrick Madrid and Ken Hensely point out in their 2010 book, The Godless Delusion, is that the question is, believe it or not, actually a proof for the existence of God. After all, if everything could be explained through material processes—a position which atheists hold—then where did the idea of good or evil come from? If there’s nothing around us but matter, and no Ultimate Standard against which we can measure human actions, what basis is there for deeming any act or situation good or evil? So the question about the problem of evil is only something those who believe in God can legitimately ask. Those who don’t believe in God, really have nothing to fall back on while attempting to explain how moral goodness–which cannot be empirically measured–can at the same time come from matter. In fact, the atheist, if he were true to his disbeliefs, would not even be able to claim those disbeliefs are true, because the reliability of ideas themselves would be called into question. Under a materialist view of the world, our ideas are mere chemical reactions. What bile is to the liver, thoughts are to the brain according to the atheist worldview. How, then, can it be determined that anyone’s thoughts (or brain products, if you will) are more accurate or reliable than anyone else’s? While it can be pointed out that those who believe in God all too often don’t live up to their own beliefs, it can also be pointed out that those who deny God all too often don’t live down to theirs. The difference is that the former is regrettable, the latter, a cause for celebration. If more atheists actually lived out their beliefs on a consistent basis, chaos would reign. There would be no moral standards; every action would be acceptable. Everywhere we looked, we would see (and perhaps fall victim to) the atrocities that have taken place under atheist dictators around the world. Amateur and professional atheists alike should realize that atheism is illogical, and that to live it out actually means to live an evil life. That may sound harsh to atheist ears, but when you take away the Source of all goodness, you only have the greatest lack of a due good that could ever be imagined. In other words, you have the greatest evil. If you don’t believe me, take it from Venerable Solanus Casey (1870-1957). 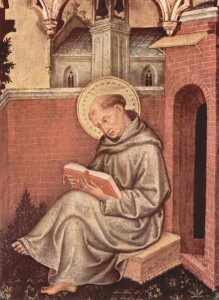 He was a modern-day St, Francis of Assisi: humble, generous, and compassionate. This gentle soul spent hours every day listening to people discuss their problems. He would give them advice, pray for them, and sometimes even work miracles in their lives. In short, he truly loved those he served. So what did he say about atheism? Despite its allure for some, atheism is a miserable dead end. All atheists, whether amateur or professional, would do well to realize their folly today, turn around, and get back to the God who loves them. There is still time.